Floatplane air service in Homer, Alaska. Brooks Camp bear viewing for the 2016 season is on! Fish are jumping and the bears are in the falls. The bear camera is live now, so stay tuned to see how many bears are out there each day! Brooks Camp is located at the mouth of the Brooks River on the shore of Naknek Lake in Katmai National Park. It is known all over the world as one of the most beautiful and best places to view brown bears in large concentrations. The bears in Brooks Camp can be seen roaming the trails, teaching their babies to fish in the lake, and pulling salmon straight out of the famous Brooks waterfalls. Our trips to Brooks Camp leave daily from Homer until September 9am until 3pm, allowing for approximately 3 hours of bear viewing time. 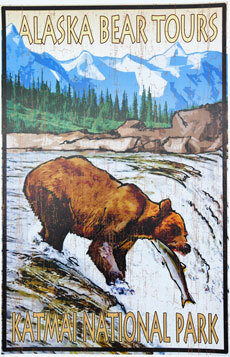 Check out the Brooks Camp bear viewing brochure, and contact us to reserve your spot. If you would like to customize your Brooks Camp experience, just let us know. We have seats available on existing flights for one way transportation at reasonable prices. Whether you would like to stay in Brooks campground, just outside of it on Dumpling Mountain with its stunning views or explore the Valley of Ten Thousand Smokes, we will provide you with plans B and C and contacts for when weather stops us from picking you up at the end of your stay in Katmai.